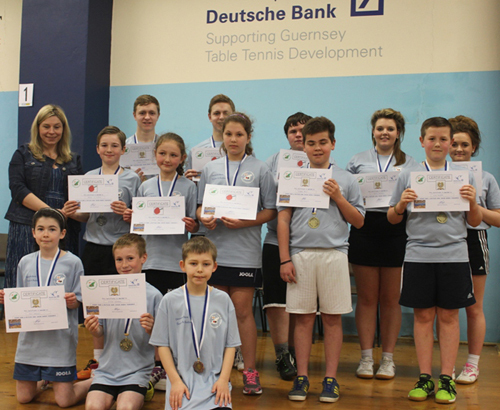 There was another good weekend of table tennis at the Guernsey Table Tennis Centre that saw 48 juniors take part in the fourth and final Deutsche Bank junior banded tournament of the season. In band one, Joshua Stacey took the title with twin brother Lawrence Stacey taking runner up spot. In band 2, Luke Bichard came out on top winning all 7 games with second place decided by count back between three players, Charlotte Casey, Matthew Casey and Ryan Bichard. All three players had won 5 games. The runner-up place went to Charlotte Casey having the better games difference. Band 3 saw fast improving Daisy Kershaw come out on top, and second place went to Nathan Pinchemain. In band 4 Alderney’s Amy Wesley went one better than she did last month by winning the band, having come runner up in February. The runner-up spot went to James Le Tissier. In Band 5 Oliver Edwards came out on top winning all of his games and only dropping 2 sets against his closest rival February’s winner Starr Cosheril of Alderney. Band 6 saw the emergence of another new star Morgan Price, winning all his matches in his first tournament and taking the title, the runner up spot went to Melissa Johns of Alderney.